Jeepin' Magazine | Tag Archive | C.O.P.S. When Stephanie Barnes’ brother was killed in the line of duty eight years ago, she couldn’t have imagined that tragedy would lead her down the path to involvement in and leadership of the West Central Florida chapter of Concerns of Police Survivors. Stephanie, what is COPS about and how long has it been around? Concerns of Police Survivors is an organization that was started in 1984 by a woman named Suzie Sawyer, after her husband was killed in the line of duty. Her mission in starting the program was to help surviving families and co-workers cope after the loss of a loved one. Among other things, COPS addresses the emotional, financial and legal needs of families; provides training to law enforcement agencies on survivor victimization issues; and provides public outreach and awareness on behalf of law enforcement and the families of fallen officers. Our West Central Florida Chapter covers a range of nine counties: Citrus, De Soto, Hardee, Hernando, Hillsborough, Manatee, Pasco, Pinellas and Sarasota. How did you get involved and eventually become president of the West Central Florida chapter? It was actually my mother that got me involved. My brother Jeff was a police officer for 13 years. He had just recently become a K-9 officer and it was on Jan. 24, 2011, that he lost his life. He wasn’t even supposed to be working that day, so it was a hard situation to handle, in the sense that it was truly a freak accident. … Well, it wasn’t an accident — it was a killing. He was in St. Pete and responding to an “assistance needed” call for a U.S. Marshal who was going to question a woman in the midst of a domestic violence situation. When they found the fugitive in the attic, there was a struggle to get him in handcuffs and, during this time, my brother was shot and killed. After his death, I accompanied my mother to Washington, D.C., for the ceremony of his name being added to the memorial wall. It was during this trip that other parents and members of COPS reached out to her and when she got involved. It wasn’t until seven months later, when my father passed away, that my sister and I began to accompany her to COPS events, for support. Right away, I realized how much the organization and chapter really did for those families in need, while coping with the loss of a loved one. When it came time to elect new members to the board, the chapter was still very small, and they asked if I was interested in the vice president position. At the time, I was pregnant and had a lot on my plate, but after some convincing I took on the role until they could find someone else. However, five years went by with me in the VP seat, and when it was time to replace the current president, Cindy Roberts, I was voted in. It was an easy decision in my mind — If I want to go forth with something, I want to make sure I am doing everything right and supporting the organization the best I can. Because it truly is such a heartfelt organization to me, I didn’t want to let them down. Since taking over Cindy’s role, we have continued to grow. 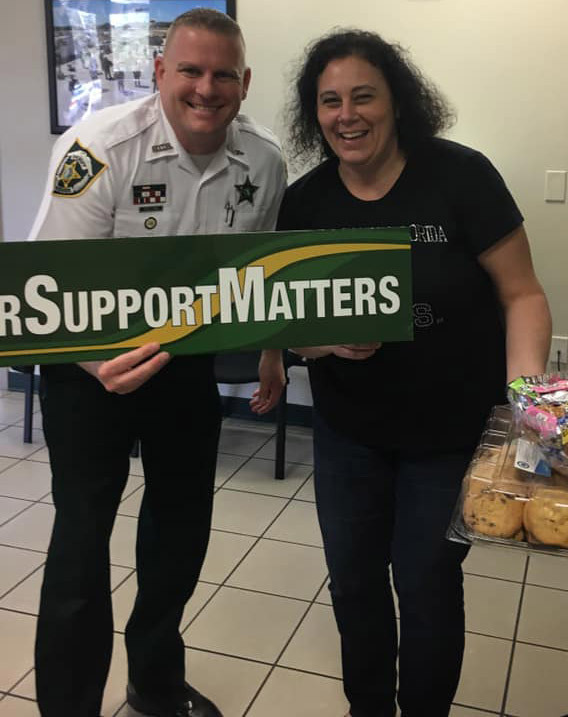 departments to drop off goodies as a token of appreciation, including Hillsborough County Sheriff’s Department at Citrus park. COPS does so much in terms of raising money and distributing it back into the community. How exactly does your organization raise money and what does that money do to help these families? Lately, a lot of our donations have been coming in through the help of organizations like Jeeps vs. Harleys and Krawl’n 4 the Fallen, that have learned about who we are and wanted to give back to us. So a lot of our fundraising comes from their help and wanting to do fundraisers on our behalf. We hold our own fundraisers at times. We’ve done a local COPS Walk. The past three years it was held in St. Pete, the same night as St. Pete’s police memorial in May. We have also done golf tournaments in the past, and we are always looking for new ways to share our mission. When an officer loses their life, we plan and pay for the trip for surviving family members to go see their loved ones names placed on the memorial wall. Our job is to actually pay for the plane tickets and hotels. It’s hard, though, because you never know how many officers are going to lose their lives in a year, so it is impossible to determine how much will be needed in a given year. When you look at that, you need to have a surplus of money to ensure that when a tragedy does happen, that the money is available to get them there. We don’t want these families coping with their loss to have to worry about it. We don’t want them to not be able to go because they can’t afford it. We also offer retreats to family members, including specific retreats for spouses, or parents, children, siblings, loved ones. It gets broken down into different levels, so for example when I attend, I am surrounded by other siblings of fallen officers. When my mom goes, she is with other parents. What a lot of officers don’t realize, and what we are really trying to get out to them, is that we also support co-workers. I can’t tell you how many officers I have run into in the last couple of months who have lost officers years ago and are still traumatically affected by the experience, because they were very close to their co-worker. The way I look at it, No. 1, they are hurting and missing their buddy, but they also have feelings of knowing that could have been them. It’s one of those situations where these officers, whether they don’t realize we also offer support to them, or there are some that do know we offer support to co-workers as well, but they don’t want to take it on the reasoning that they are in turn taking away from resources that could be give to their actual family members. To me, that is non-negotiable. They need this as much as the family members do. What is COPS doing to help spread awareness and get the name out there? Any event that we are invited to, I go to, whether they are donating to us or not. For me, it comes back to how can I get my name out there and we strive to find new and creative ways to do so. As I said, I try to sell items with our name on them, even if it’s just for $1 and I wind up losing money, it’s worth it. We are part of programs that spread awareness in schools. There is National Law Enforcement Appreciation Day, which took place Jan. 9, and is run by the national COPS organization, and each chapter participates in their own way. One of the things that we have done the last few years is create goodie bags, or as we call them, “Officer Survivor Kits” to give to all the families of law enforcement officers, in a school. Every little thing counts. What is your impression of the Jeepin’ community? In getting to know the Jeep community, I can’t say enough how appreciative our organization is of their support. It brings chills to my arms seeing how kind everyone is. Even those that have no connection to law enforcement, the desire is still there to help us both financially and emotionally. It really means a lot to us, we are truly grateful. Stephanie Barnes is president of the West Central Florida Chapter of Concerns of Police Survivors. To learn more about their mission, visit WestCentralFLCops.org. JCF Donates Harley to Support C.O.P.S. 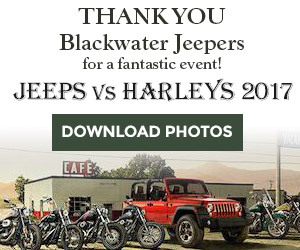 Jeepin’ Central Florida is pleased to announce that we will be donating a Harley Davidson Motorcycle to be raffled off at Jeep vs. Harley – Rematch 2018. We will post additional information shortly on the bike and how to get your raffle tickets.